Speedy service has got to be a winner! A call at 5pm on a Friday night asking for a major window cleaning programme to be completed by 9am the next morning had commercial cleaning company Aquamark gathering the team and setting off at the crack of dawn in order to meet the challenge. A week or so before Christmas, a new flagship Superdry outlet was due to open on London’s Regent Street. The builders finished in time the night before the grand opening, but the store’s windows were in desperate need of an after-build clean so that they were ready for the deluge of shoppers that were expected through the doors the next day. Just over 12 hours later, the specialist team from Aquamark (http://www.aquamarkwindowcleaning.co.uk) was on the premises with their water fed poles, and the job was done in good time – and with great praise. This is just one of many jobs that the Surrey and London cleaning company has successfully completed at short notice. In the early summer of 2011, they stepped in at the last minute to clean the glass and handrails at Westfield Stratford, again through a last minute call and just in time for its grand opening. And when they tackled the award-winning Harlow Foyer, a feat of environmentally friendly architecture that needed highly specialist cleaning – and posed awkward access issues to boot – they beat the completion deadline by a week. Aquamark has a reputation for being a can-do cleaning company. They’ve cleaned a range of high profile sites, such as the Royal Ballet School, Wimbledon’s Centre Court, and Chelsea’s Kings’ Estate. About: Aquamark is a 20+ year established commercial cleaning company with offices in Mayfair, West London and New Malden, Surrey. The company has cleaned some of the most high profile sites in London and the south east, including Westfield Stratford, The Royal Ballet School and Centre Court at Wimbledon. 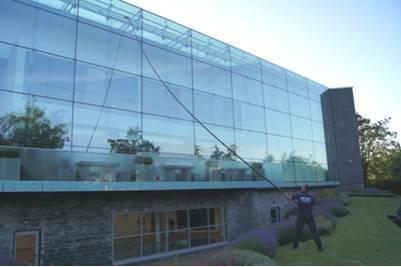 Services include specialist window and glass cleaning, high rise cleaning, abseil cleaning, construction site cleaning, office cleaning, retail premises cleaning and industrial cleaning.